Known as “Earthrise,” this is the image NASA released to the world after Apollo 8 returned from the moon in 1968. But, this is not the perspective of the original photo; NASA flipped it 90 degrees to the right and cropped it so Earth and humans would appear more important above the moon. Earthrise — it’s one of the most iconic and important photographs ever taken by the human species. As the Apollo 8 astronauts orbited the moon in December of 1968, they turned their cameras back toward Earth and astronaut Bill Anders took the famed photograph—the first widely disseminated photo of Earth in space. But, it’s a photo that is much more than what it seems on the surface. 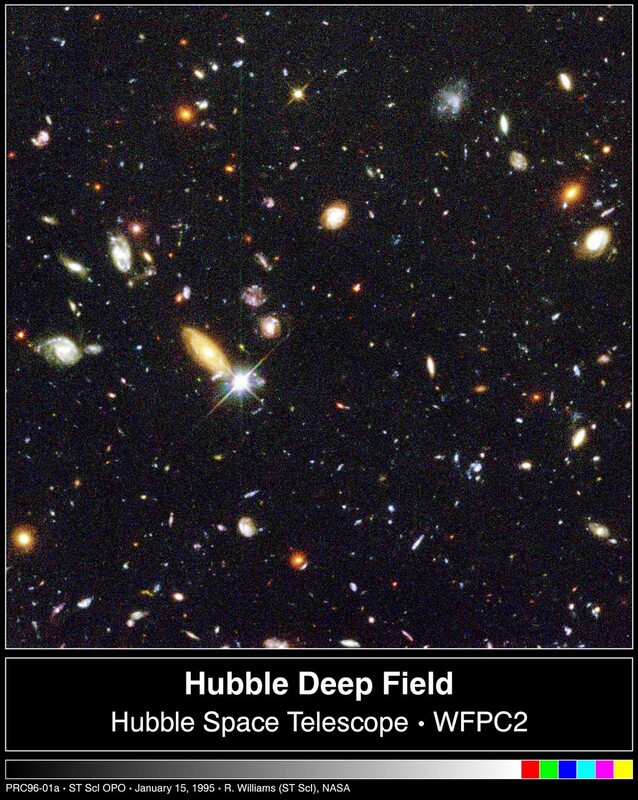 Rather than illustrate our actual place in the universe, the photo was altered by NASA to maintain the illusion of human centrality amid the cosmic void surrounding Earth. Five decades later, NASA’s move has proven prophetic for post-Apollo culture. Earthrise is the first “Earth selfie” and points directly toward the Anthropocene, social media culture, and humanity’s deep narcissism—still pretending to be the center of the universe, the center of all value, purpose, and meaning on Earth and beyond. Without doubt, Apollo 8 and Earthrise triggered a profoundly sublime moment for humanity in 1968. Apollo 8’s television broadcast from the moon reached one billion viewers. 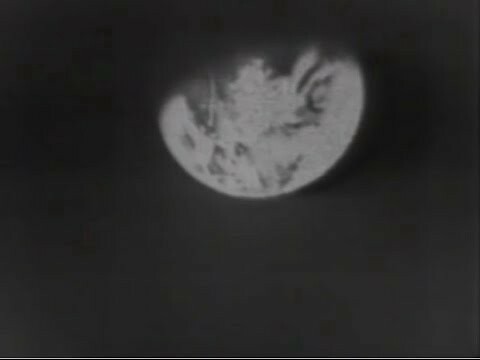 During the journey to the moon, Apollo 8 provided the first image of Earth in space—a grayish orb on television screens. Stunned, the world looked on with awe and wonder. To borrow from Kant and other aesthetic philosophers, we encounter the sublime when there’s a tension between our perceptions and our reason—when our senses are overwhelmed, yet our minds can still order the percepts into knowable, pleasurable, and terrifying concepts. Perhaps the deepest sublime is the sublimated terror many people feel in the face of epic emptinesses and vast voids in the starry skies above. Since no one had seen Earth from space, Apollo 8 and Earthrise provided an overwhelmingly new perspective on human existence. The image of Earth alone in space was utterly mind-boggling in 1968, an era in which television was relatively new and there was no internet, no Voyager, and no Hubble Space Telescope. With the full-color image of Earthrise, our home planet was knowable and pleasurable, surely a beautiful image to appreciate and contemplate. But, the key to the power, meaning, and effects of Earthrise is the simultaneous sense of wonder and terror. The image was wondrous because of the sheer genius and scientific power it took to get a camera in orbit around the moon—and then see our entire planet floating against the endless black void. That’s where terror enters the picture. 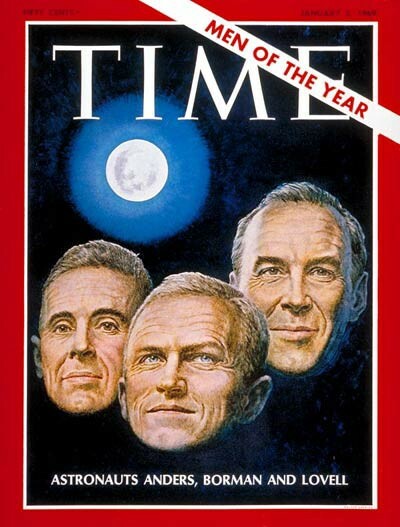 The Apollo 8 astronauts were worldwide heroes and named “Men of the Year” by Time magazine, with the cover depicting their faces against the void of deep space. In so doing, Time subtly illustrated the key issue of Apollo 8 and the Earthrise image — the cosmic void. After all, it seemed the astronauts had conquered the void when they read from Genesis to one billion TV viewers while orbiting the moon. Not only had Apollo 8 “saved the year” of 1968 (as mainstream historians tell us), the astronauts also saved the dominant ideologies on Earth—the belief that we’re central to the story of the universe and its Creator has an eternal destiny for us. The Genesis reading consoled humanity for the sublimated terror felt in seeing Earth alone in the cosmic void. If that conclusion seems unlikely or implausible, we only have to consider how Apollo 8 and Earthrise were connected to the void and what NASA subsequently did with the image. In an article on the Apollo 8 voyage entitled “The Triumphant Return from the Void,” Time celebrated Earthrise by dedicating an entire page to it with the heading “The Awesome Views from Apollo 8.” Time clearly suggests that Apollo 8 and Earthrise triggered a sublime experience. With Earth seeming to float in the cosmic void (though in reality it is hurtling through the universe), Apollo 8 and Earthrise provided the human species with its first visual perspective of its true existential condition, namely that we share a tiny planet in a massive universe. Visible in Earthrise are no borders, no nations, no signs of humanity — just the planet’s blue waters, white clouds, and brown and green continents, all amid the blackness of space, beyond which are trillions of galaxies with billions of stars. Time stated: “In the closing days of 1968, all mankind could exult in the vision of a new universe . . . a new age, that will inevitably reshape man’s view of himself and his destiny.” But if the destiny is unbearable, then it may as well be denied. In the black cosmic void lies the sublimated terror and existential fear that still exists well into the 21st century. The stars of the Milky Way are not visible in Earthrise because of the bright sunlight reflecting off the light gray surface of the moon. The black starless sky emphasizes the void of deep space. In artistic and aesthetic terms, the blackness surrounding Earth is the negative space that frames the object of contemplation in Earthrise. Humanity is still coming to terms with that negative space, for we know it stretches toward infinity with no vanishing point, unlike traditional painting and photography. That negative space means we humans and our beautiful planet are not the center of the universe, not the center of anything in a cosmos spanning across 100 billion light years. For humanity, so far, that is an unbearable condition. Fear of the void, fear of all that negative space, that’s the existential reason why NASA repositioned Earth above the moon (and not beside it as seen in the photo’s original perspective ). By flipping the image and cropping it to give more prominence to Earth, NASA created an icon to humanity’s narcissism. 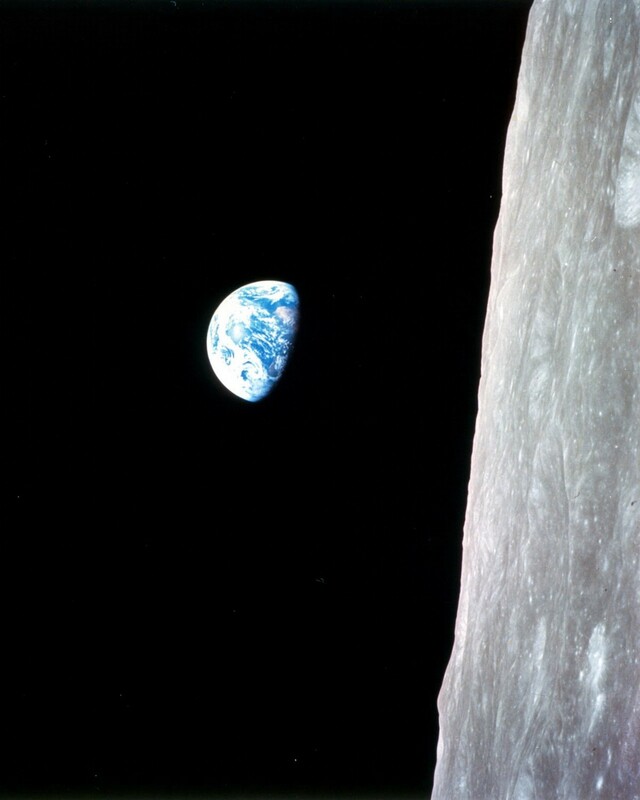 The official version of Earthrise does not represent the visual orientation seen in the original photo. Bill Anders’s shot featured Earth next to the moon, not above it. Had the original photo been widely publicized instead of the altered version, it would have provided us with the first chance to view Earth in the cosmos as it really is — a planet existing amid a vast universe in which we are not central nor significant. Instead, NASA flipped the photo on its side so that Earth seemed to be “rising” above the moon’s grey horizon. The image was also cropped to give more prominence to Earth. It’s cosmic narcissism countering possible cosmic nihilism. (Obviously, there is no absolute up or down or “above” in space and no single absolute visual orientation of Earth to the moon, except that the moon orbits the Earth. The image in Anders’ photo was determined by where he was sitting and the perspective of the camera, not an absolute relation of Earth to moon.) What matters here that NASA repositioned Earth in the photo to soothe humanity’s existential ego. The mere visual image of Earth beside the moon is existentially vertiginous compared to Earth above the moon. Against that blackness of space, our artists and philosophers have yet to develop a cosmic cultural narrative to counter cosmic nihilism, which is why there was a second version of Earthrise to begin with. Earth rising above the moon is much more comforting, providing the cognitive warmth of a morning sunrise. By contrast, Earth floating beside the moon with nothing above or below it is visually vertiginous, suggesting we could fall off with nothing below us and tumble into the abyss of meaninglessness. The visual vertigo and cosmic nihilism of the original photo were ostensibly unbearable for our species—while it generated awe and amazement, it also made us feel insignificant because our systems of meaning were destroyed before our eyes. In other words, Anders’s original photo rocked the dominant worldviews spanning across previous millennia. So what did the astronauts do later in the voyage? To comfort a global television audience of one billion people, they read the first ten verses of Genesis from the Bible. At the moment of the great scientific and technological triumph, cosmic vertigo emerged and Apollo 8 crashed on global television. 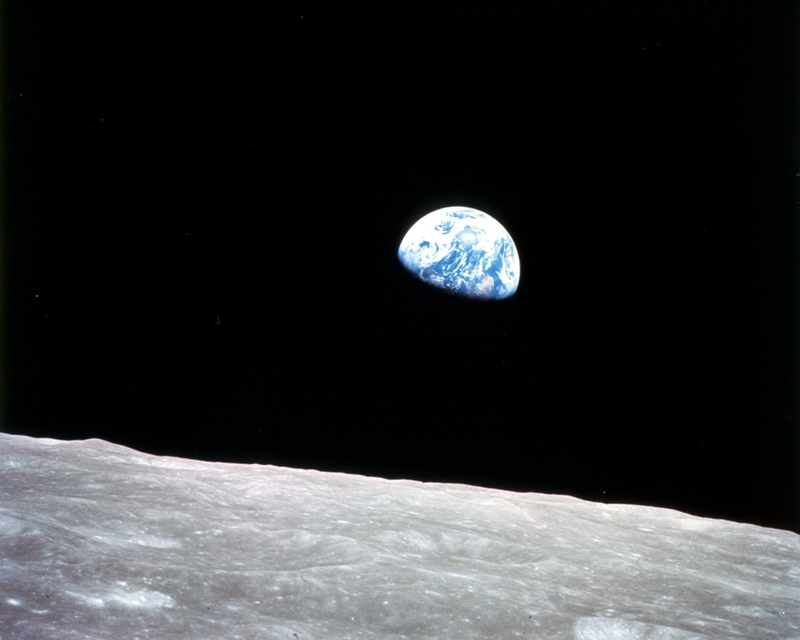 Fifty years later, the philosophical legacy of Earthrise is clear. Earthrise certainly inspired a new planetary ecological consciousness and helped reboot the worldwide environmental movement. For that, we owe a big thanks to NASA and the Apollo 8 astronauts. On the other hand, NASA flipped the Earthrise image to make it easier to process intellectually and existentially. It was a cop out of epic scale. 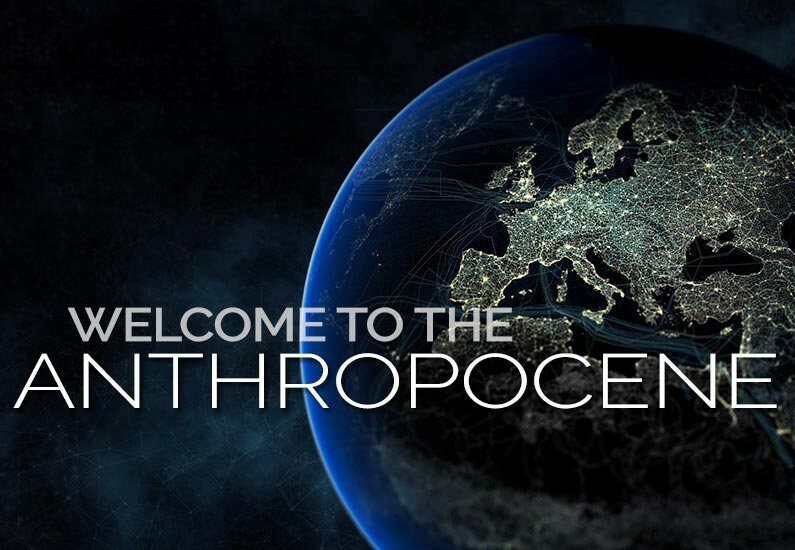 THE ANTHROPOCENE: For the most part, we have largely ignored the environmental message of Earthrise. We continue to trash the planet, endanger the ecosystems, and effect what scientists call the Anthropocene — the “human epoch” in which our mechanized, electrified, and industrial civilization is transforming the geological surface of Earth. Our consumption and pollution are literally altering Earth’s surface and ecosystems. Though positive steps are being taken toward reducing our impact on Earth, a sustainable civilization still remains a vision on a distant horizon. SELFIE CULTURE: NASA’s altering of the image to maintain our cosmic centrality strangely anticipates the selfie culture of the 21st century. If NASA can pretend our entire species is central and special, then why not all the members of our species? In effect, NASA’s flipping and cropping of the image converted Apollo 8 from a spacecraft to a selfie stick. 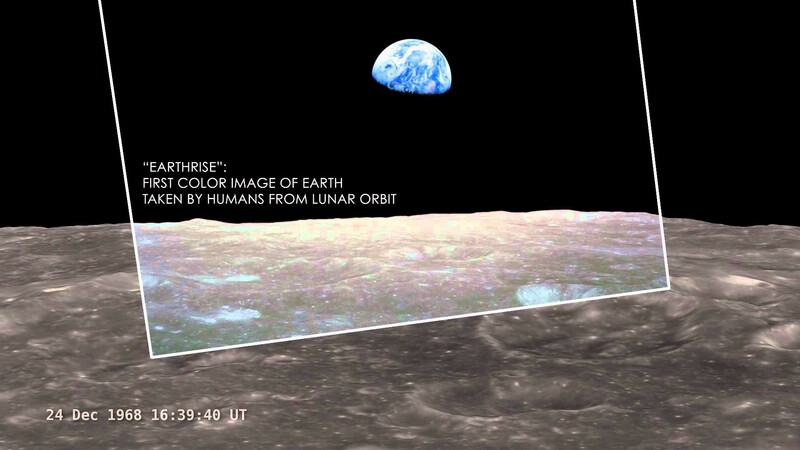 THE ULTIMATE NARCISSISM: The Earthrise image and the Apollo 8 Genesis reading represent the ultimate in human narcissism. It’s a cosmic narcissism that embraces an imaginary centrality and the belief that the Creator of a universe of two trillion galaxies has an eternal destiny for members of a single species on a tiny planet in a single galaxy. Is there anything more narcissistic? NASA is America’s most important contribution to the long-term destiny of our species. That’s because NASA has been at the center of our journey into our true place in the cosmos. We face the paradox of our greatest intellectual achievements — we have discovered a vast and majestic universe in which we are insignificant and perhaps meaningless as a species (cosmic nihilism). That’s the philosophical challenge of our post-Apollo culture. Why not embrace our true place in the universe, as revealed by NASA, science, and our most powerful media technologies, such as the Hubble Space Telescope. Why not embrace the full range of the sublime and its liberating aesthetics. Only then can we begin to confront the true meaning of Earthrise and our origins and destiny in the universe. We are a single evolutionary species, sharing a tiny planet with millions of other evolving species, in a vast and majestic universe of two trillion galaxies and untold numbers of life forms and black holes, along with vast empty voids — all stretching across 100 billion light years. We’re not central and not significant. The universe is too awesome to pretend we’re the center of it. To me, that’s liberating and exhilirating. That’s the power of the sublime! And that’s the challege we face, to reconcile our tininess with our braininess in the sublime NASA universe. To paraphrase the great astronomer Jill Tarter, we humans are what happens when hydrogen atoms evolve for 13.7 billion years to wonder where they came from and where they are going. When are we going to grow up? Barry is author of Specter of the Monolith (2017), a book that presents an entirely new space space philosophy based in science, aesthetics, ecology, and planetary cooperation—inspired by 2001: A Space Odyssey. Critic of civilization via art & theory. Co-editor of "Black Mirror and Critical Media Theory" (2018). Existentialist w/o the angst. PhD: U of Texas at Austin. Illustrated essays presenting a new space philosophy for the 21st Century. 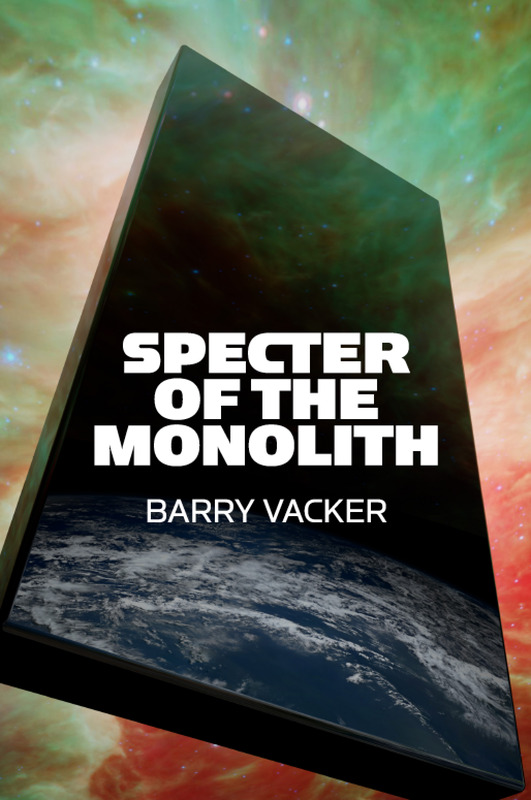 Inspired by 2001: A Space Odyssey with excerpts from Barry Vacker's epic book "Specter of the Monolith." Though the essays date from 2017, the "Explosion of Awareness" page was started in July, 2018.